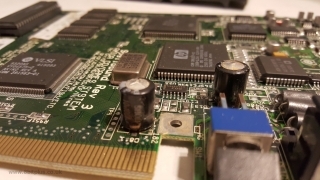 Repairs required to getting my Amiga CD32 games console working again. 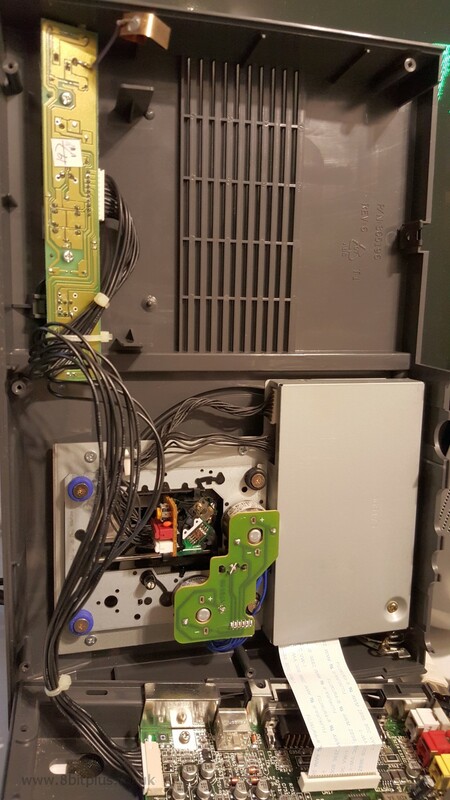 Replacing CD-Rom and faulty capacitors. I recently uncovered a box in my storage location containing my Amiga CD32. It came from a boot-fair (flea market) many years ago. I remembered it did work when I first used it, but soon stopped. It was then put into storage for about 12 years. Back then I had no way of finding out was was stopping it working, but now I have much more experience with consoles fixing and electronics. 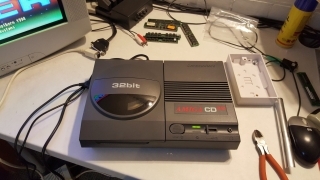 The CD32 was of very little value when i picked it up, I think I payed £15 for it working with a few games. Now they often go for over £130 with the same setup. I don’t have any interest in selling, but as a collector I want it to be in working playable order again. After opening the console and inspecting the motherboard it was easy to spot the main suspect. 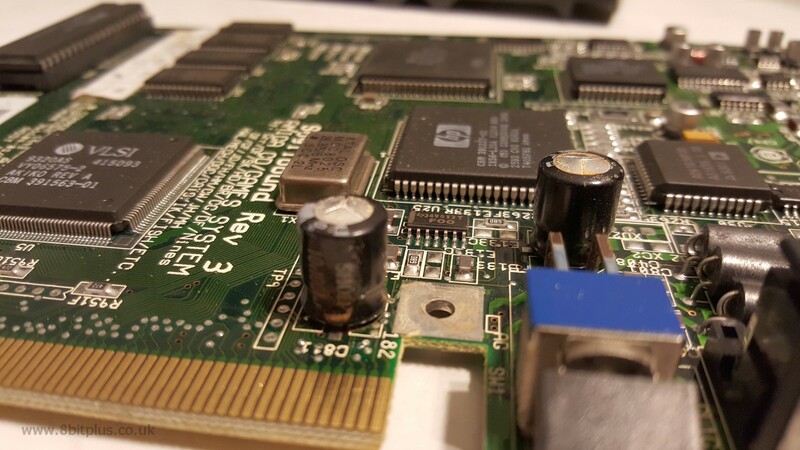 The two large capacitors near the Power connector were bulging and showing signs of leaking, therefore need replacing. I removed the motherboard from the CD32 case and unsoldered the caps. (Original values: 1000uf 10v). the caps I replaced them with are the same value of 1000uf but rated at a higher voltage of 20v. Its no problem to use the higher voltage caps as its a “max” tolerance value and nothing to do with the output. 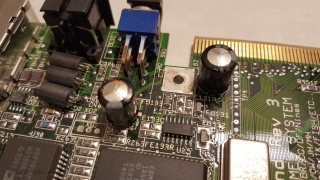 One thing I found out while researching this problem was that Commodore actually installed these caps the wrong way round on most CD32 motherboards. The problem was that the printed overlay on the PCB shows the incorrect orientation for the 2 caps. You can see I have installed the new caps the correct way round. I also lay the caps on their side as they are taller then the originals, and might get in the way of the expansion bay. that’s more like it. now it powers on and plays the boot animation. I put a game in the drive and…… not much happened. Looks like the next problem is a faulty CD-Rom drive. It didn’t try to spin the CD, and only made a click sound. I suspect this is the laser trying to detect a CD. I confirmed this by pressing down on the center of the spindle (this is how it handles the tray open or closed detection) and observed the laser moving up and down without and light from its laser diode. In conclusion I believe the drive is dead. Either that or not receiving power to the diode. The install is very easy. Just remove the 4 screws holding it to the case lid and its free. The data ribbon cable to the motherboard needs removing with care, because the retainer clip can break easily. Another lottle job was to replace the missing RF-Shield top plate. The absence of this shielding can cause read errors on some units, and mine certainly worked better with one. No idea why it was missing in the first place. Thanks to mjnurney at AMibay.com for hooking me up with a replacement. After resembling I was pleased to see it reading game CD’s for the first time in over 12 years. 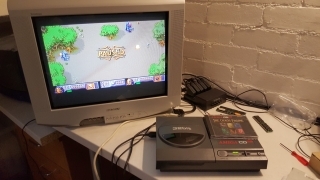 The CD32 version of Chaos Engine plays perfectly. No stuttering in the animated intro, or with the CD background music because of the replaced rf-shield. Other capacitors can sometimes cause faults in music playback, but not in this case. 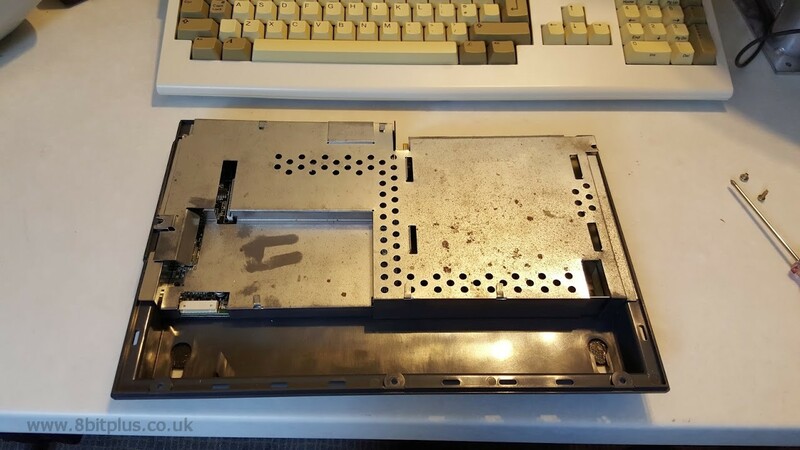 Something to look forward to is the Project Hermes upgrade for the CD32. 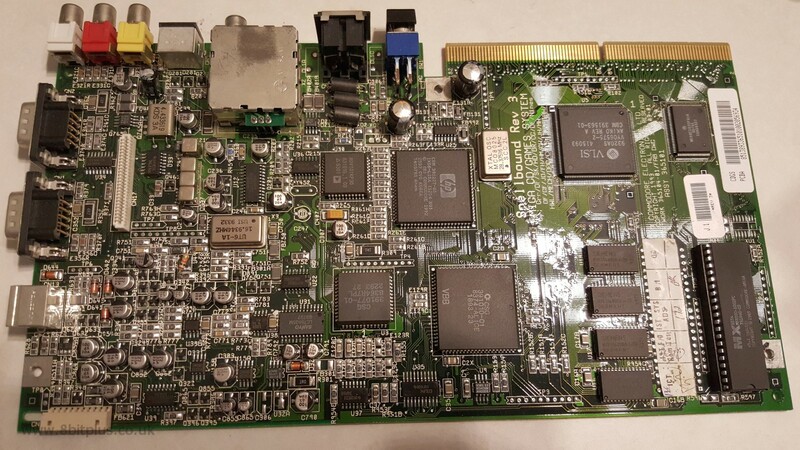 Developer Ian Stedman is creating an expansion card to add 8mb of Fast Ram. 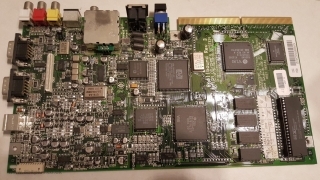 In addition to an IDE connector, floppy connector and RGB output. 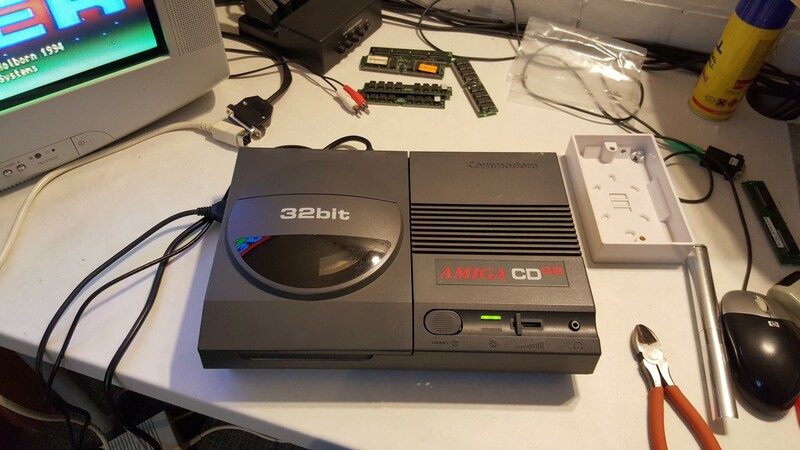 This would effectually turn the CD32 into an Amiga 1200. An internal drive would allow for Workbench and WHDload to be installed. So, by my reckoning, this fault must be something and nothing, since the console powers up fine, with no other issues, nice enough screen even through just RF, and no sound issues, I just can’t play any damn games properly although they will load up. Is this fault familiar to you, or anyone else out there? I really would like to get it sorted and have a properly working console again. 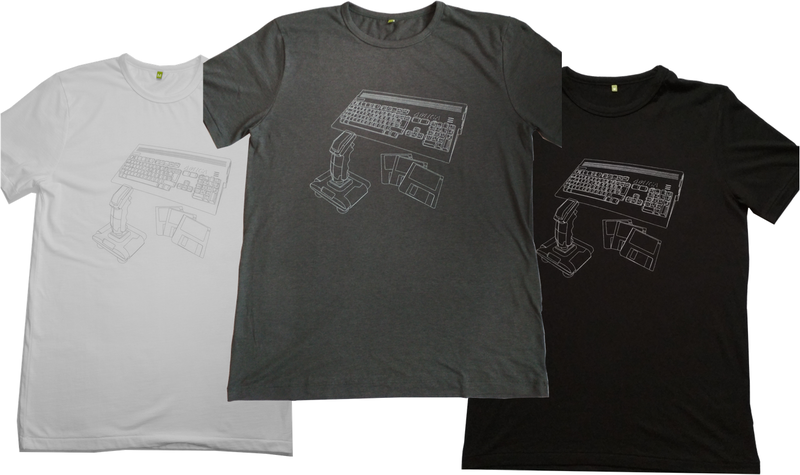 fixed my Three button Amiga mouse by doing just that, so give it a go. I’m looking for a metal shielding as it is removed from my CD32. Anyone have a spare one to sell? (to Finland), I would be interested. Picture from which output? have you tried the s-video port? 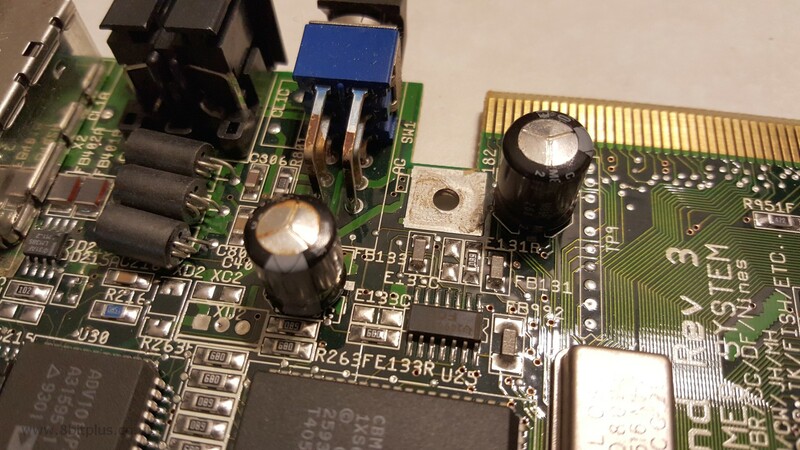 Both of those electrolytic capacitors were installed the wrong way around at the factory on a particular revision board. Probably why they were bulging. You might want to open it and check again if you installed them the correct way around. 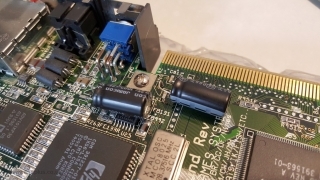 The negative side of the capacitors footprint on the PCB will be common with the supply negative. Hi. I did mention that in the article. They are the correct way round. Known problem. Hello, I also try to revive my old Amiga CD32. When I start it the power LED lights up but there is no reaction from the console. No noise at the CD reader and when I hook it on a TV it’s just a blank screen with no sound. If I remember correctly, I might have by accident touched the Player1 input port with some metal while the console was running. Did it short circuit or something? 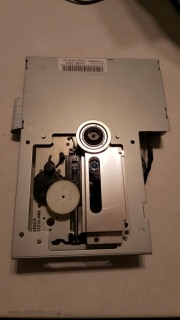 Try removing the CD-Rom drive and testing the voltages at PSU. If it needs repairing perhaps someone on Amibay could fix it. 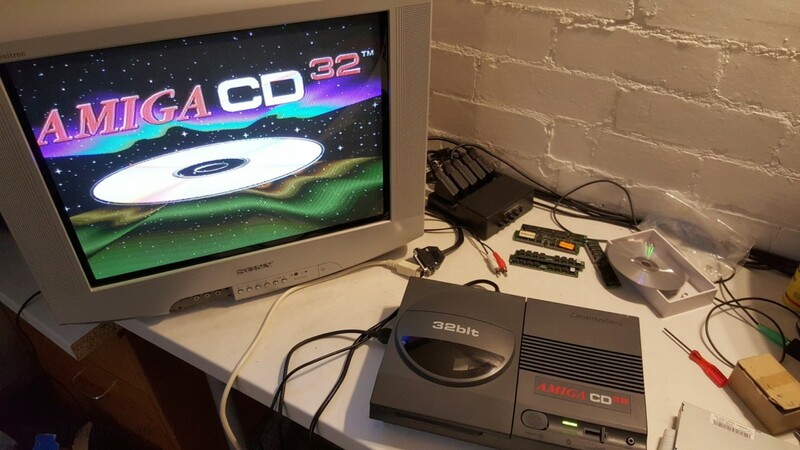 I have CD32 for year or two by now. Last few months often when I turn it on I was getting only black screen but if I’d open cd tray, green LED would light little brighter and trademark animation screen would appear and I could use it normally. In last week or so that stopped helping. So I disassembled it completely, cleaned and assembled it again but without shielding. There was trademark screen right away but if I would insert cd(I have burned ones only)cd would start spinning but none could be loaded. I put back that “magical” shielding cause I’m really wondering what it has to do with cd reading(maybe drive actually is supposed to lean on it on that triangular bent part that is sticking and get some contact???) and cd started loading every burned cd and playing cdxls without problem.